I’ve been watching a lot of videos lately about boats. I don’t own a boat, but I think they’re cool. I’ve been watching videos about the narrowboats that cruise around the canals of England and Wales. I’ve been watching videos about catamarans sailing the oceans. Big boats, small boats, it’s all good. What I’m learning in watching these videos is that sailors often have to prioritize work and tasks to keep the ship sailing towards its destination. We face similar challenges in our marketing and web offices. We are often understaffed and overrun with projects, some mission critical and some that are not as strategic. Often, leadership at your institution or division will say that we, as web and marketing folks, need to organize, prioritize, and measure the effectiveness of our work so that we can use that data to say no to requests that we typically receive from departments, schools, colleges, and other groups across campus. T here are many KPIs you can use to help prioritize your projects and leverage as your department’s reasoning for saying no. Of course, you need to find the metric that makes the most sense for your institution or group. Maybe you say that your department now has marching orders to focus on projects and work that drives tuition revenue. Maybe you say that your new focus is on undergraduate enrollment. Graduate enrollment. International students. Retention. Capital giving projects. A certain element of the strategic plan. You’re focusing on your President’s passion project. You get the general idea. All of those things are ways that we can use to tell people no. There are different ways you can sail the seas of no. You can give a hard no. Maybe you use a “no, but,” where you offer to do the work but give a deadline that’s far off in the future. Perhaps, you ignore the request altogether. Each of these methods is full of peril and rocky shoals. In my experience, people on campus react one of several ways. In a perfect world, they’d understand the importance (or not) of their project. They’d appreciate our honesty and straightforwardness and understand why we can’t do a poster for the speaker coming to campus that a handful of people will go to1. Often the one we had one week’s notice of. More often than not, this would happen. We would nicely, and politely, say no to a project, via phone or email. We would feel good about our decision and get back to our work. Then, sometimes as soon as ten minutes later, the phone rings and the caller ID shows that a dean or vice president is calling. I know right away what they want. On some occasions, that conversation would happen at a VP to VP level. I don’t know if that’s better or worse. Sometimes they’d back down, but often, despite our arguments, we’d still do the work. We’d shuffle projects around, work late, or farm something out in order to keep the project moving and get it completed. I get why the departments push back. No one wants to be told no or made to feel that the work they’re doing isn’t important. They feel they, like marketing, is understaffed and overworked. 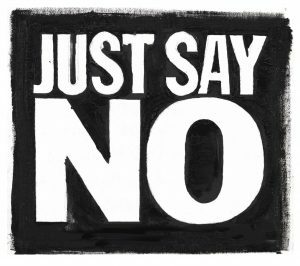 Pushback and saying no is a problem that I have yet to solve in my 20 years of working in marketing and web. I’ve been thinking lately about why that is. Personally, I don’t like saying no. I like making people happy and I like doing good work for my institution. I want to have good relationships with folks across campus and I want them to like me, too. I admire folks who can stick to their guns and continue to say no. My question is how do you do it? How do you say no, back it up with data, and get offices across your campus to understand, and ultimately, accept the fact that a marketing or web team can’t take on their project, for whatever reason works for your institution. Much like I can’t sail a boat, I want to learn how to say no and bring calm seas to my life. 1 – We found that electronic means was a much easier and time-saving method for promoting limited-interest on-campus events. Tools include social, intranet, digital signage, and other campus calendering sites.